Background: Microencapsulation is one of the most common techniques for the delivery of macromolecules; however, it can cause various stability problems, such as degradation or loss of bioactivity of the loaded molecules. For this reason, several techniques were investigated to load insulin into pre-formed porous microparticles (MPs). 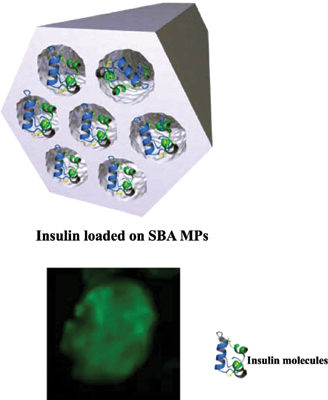 Objective: The high loading of insulin is a prerequisite of its delivery in sufficient concentration; hence we examined insulin loading in mesoporous silica (SBA15-NH2) as a model for uniformly porous microparticles using different loading methods and factors. Method: The MPs were characterized with respect to their morphology, porosity and pore diameter while insulin adsorption into the porous substrates was investigated using immersion and freeze-drying at different pH and initial peptide concentrations. MPs were further coated with Chitosan as a technique for pore blocking. Results: The results showed that the extent of insulin adsorption by freeze-drying varied depending on substrate affinity to insulin and pH where it could achieve the highest loading capacity at a pH near its isoelectric point. A significant increase in drug loading along with slower drug release was observed with Chitosan coated SBA15-NH2 MPs. In addition, the structural integrity of insulin was maintained after loading into the MPs, as confirmed by gel electrophoresis and fluorescent spectroscopy together with the in vivo study which in turn confirmed the preservation of insulin bioactivity in lowering blood glucose after oral administration. Conclusion: The present work displays the various factors that can control insulin loading in mesoporous silica MPs and their effects in enhancing the efficiency of insulin oral delivery using such substrates. Keywords: Chitosan coating, freeze-drying, insulin, mesoporous silica, microparticles, post-synthetic loading. Keywords:Chitosan coating, freeze-drying, insulin, mesoporous silica, microparticles, post-synthetic loading. Abstract:Background: Microencapsulation is one of the most common techniques for the delivery of macromolecules; however, it can cause various stability problems, such as degradation or loss of bioactivity of the loaded molecules. For this reason, several techniques were investigated to load insulin into pre-formed porous microparticles (MPs).